How can I keep an area next to a mountain range from being a desert? My world has a continent in the northern hemisphere that lies primarily in the Ferrel cell where the westerly winds are. The continent is fairly large, just a tad bit smaller then than North America. On the East coast there is a mountain range running from the top to the bottom of the continent, it's biggish. Tall enough to have snow, but not ridiculously massive. My problem is I want to have a region further east of these mountains, between them and the sea, that has a climate similar to that of Baltimore or just the general area of the East Coast United States. However I am unsure as to how this would be possible given the geography of this continent. So, how can I make this possible? Or is it completely impossible? So you want a less eroded version of the Appalachian Mountains? If rain (and humidity) come from the ocean, mountains will not stop areas between the ocean and the mountains from getting that rain. The existing East Coast of the United States is quite wet, because the rain does come from the Atlantic (from the east and the south, even the southwest in some places) and it hits those areas before the mountains can be an issue. Yes, the winds are westerly. But, hey, there's a mountain range blocking winds from the west from hitting the East Coast. Some will get through, but the ocean will have a lot more influence. All you have to do to avoid a desert is to assume that the westerly winds have less of an effect than the general movement of the wind over the oceans. With higher mountains than what exist in real life, you may get rain shadows to the west of the mountains, especially if the westerly winds that hit the base of it aren't bringing moisture. If weather patterns have more trouble clearing the mountains in your world vs our real world, you may end up with an East Coast that is wetter than what already exists. Simplest answer is create a jet stream that is usually aimed off the ocean onto the land and funneled down the mountain line. This can be used to explain any number of rapid weather changes that your plot needs. One stream hits the mountains and goes down. Another goes around the mountains pulling warm air back up, and snow and rain with it. We don't really understand what drives a jet stream, so you can make it do pretty much whatever you want. 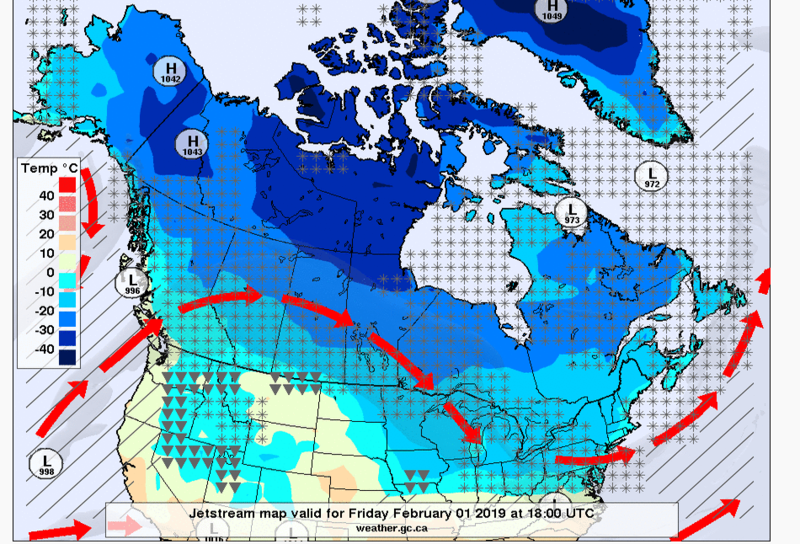 In the picture above, the stream is dragging warm air from the states into Canada, pushing away cold air. The collision of warm and cold causes snow for everyone under the stream. Snow is marked with *s in the picture. See how the snow appears to follow the jet stream? It's the same with rain in the summer. Not the answer you're looking for? Browse other questions tagged reality-check climate geography deserts or ask your own question. Is it possible to prevent colonization from the sea of one hemisphere from another hemisphere? Are my deserts accurately positioned? What could cause the desert?